His Majesty King Hamad bin Isa Al Khalifa is the eldest son of the late Amir of Bahrain, Shaikh Isa bin Salman Al Khalifa. 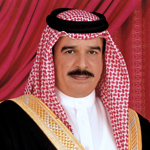 H.M. the King was born in Riffa on January 28, 1950, corresponding to Rabe'a Al Awal 7, 1369, on the Hijra calendar. In 1964, following the completion of primary education with honours, H.M. the king was proclaimed Crown Prince on June 27, 1964. On his return, H.M. the king played an active role in preparing the outline of the Bahrain Defence Force (BDF) which was bolstered by an Amiri Charter issued in August 1968 that created the BDF. H.M's interest in sports and youth was enhanced by his appointment as President of the Supreme Council of Youth and Sports in 1975 with Amiri decree No 2. H.M. the King has always shown interest in sports, especially horse riding.